Junior Achievement of Southwest Florida is seeking entrepreneurial, business-minded teens for an exclusive weeklong summer camp in which they’ll learn what it takes to become a successful business leader. Open to rising high school juniors and seniors from Charlotte, Collier and Lee counties, the CEO Academy teaches students the basics of starting and operating a successful business. 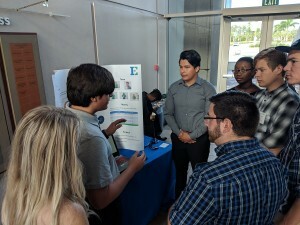 Under the guidance of experienced local business leaders, entrepreneurs and Florida Gulf Coast University professors, participating students work in project teams to develop a unique business concept and comprehensive business plan. Students can expect lessons in economics, entrepreneurship, ethics, finance, global economy, marketing and international trade. The 2019 CEO Academy runs from June 3-7 at FGCU’s Emergent Technologies Institute, located at 16301 Innovation Lane in Fort Myers. Camp hours are 9 a.m. to 4 p.m. Monday through Friday. Thanks to generous supporters, Junior Achievement of Southwest Florida is pleased to announce that college scholarship money will be awarded to each student on the winning team for the business plan competition held at the camp’s conclusion. A distinguished judging panel consists of past Junior Achievement Laureates, who themselves are exceptional entrepreneurs and have been recognized for making a significant contribution to the economic development of Southwest Florida while adhering to high moral and ethical principles. This opportunity offers students invaluable knowledge and experience from successful business leaders and entrepreneurs, which provides an excellent addition to a college application and the chance to participate in future Junior Achievement events. Interested students may apply by visiting Junior Achievement of Southwest Florida’s website or calling the office at 239-225-2590. There is a $100 application fee, which is fully refundable if the student is not selected. The deadline for applications is Wednesday, May 1. Complete details about the CEO Academy are available online at www.JASWFL.org. Junior Achievement is the world’s largest organization dedicated to giving young people the knowledge and skills they need to own their economic success, plan for their future, and make smart academic and economic choices. Junior Achievement programs are delivered by corporate and community volunteers, and provide relevant, hands-on experiences that give students from kindergarten through high school knowledge and skills in financial literacy, work readiness, and entrepreneurship. Today, JA reaches 4.8 million students per year in more than 100 markets across the United States, with an additional 5.6 million students served by operations over 100 other countries worldwide. Locally, Junior Achievement of Southwest Florida partnered with more than 200 classroom business volunteers during the 2017-2018 school year to provide nearly 63,800 hours of instruction to more than 11,600 students in 519 classes throughout Collier, Lee and Charlotte counties. For more information on Junior Achievement of Southwest Florida, visit www.JASWFL.org, call 239-225-2590 or email info@jaswfl.org.